Who was JH Lord? | Geoconferences (WA) Inc.
You are here: Home / Travel grants / Who was JH Lord? 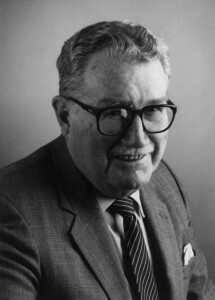 The JH Lord Travel Grants are provided in memory of Mr Joseph (Joe) Henry Lord (1919-1999), who was instrumental in setting up Geoconferences and was its inaugural Chairman. During his time in senior positions in both Government and industry, Joe Lord made a major contribution to ensuring that Western Australia remains a focus for exploration and mining by promoting the need for the geological community to be well informed and up-to-date. He was Director of the Geological Survey of Western Australia (GSWA) for twenty years, from 1961. Upon his retirement from the GSWA, he set up and initially directed the Western Australian Minerals and Petroleum Research Institute, later the Minerals and Energy Research Institute of Western Australia (MERIWA).